Facebook reports Q2 earnings tomorrow. 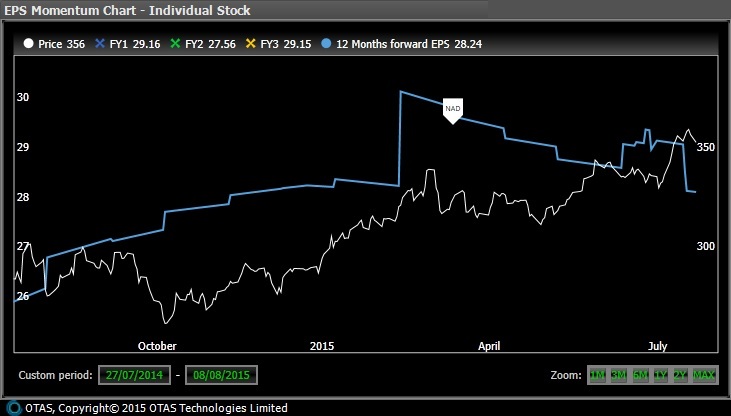 OTAS is highlighting that despite the stock price being divergent with Volatility over the past month as the price has pulled back from the highs recently, an increase in volatility may be pointing to something else. Filtering the Dashboard for Events this week and then sorting by Divergence, FB US was one name of interest. The stock has performed better than other social media names post the Q1 earnings season and has only recently become overbought. There was a technical signal that fired four days ago which shows the stock as overbought. 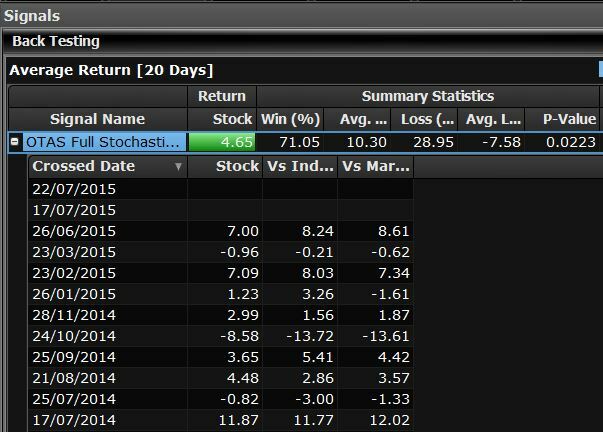 However, with our backtesting over the past 9 years, the stock actually continues to trade higher 71% of the time. 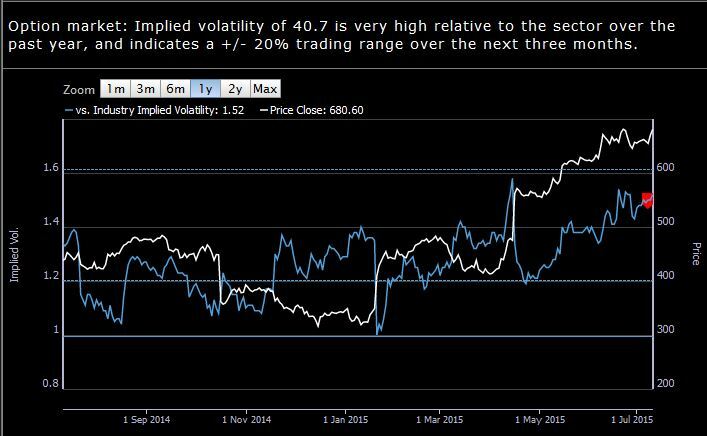 Digging into the Volatility,we see that the stock’s 3M implied vol is higher than its peers by over 2 standard deviations, and its own absolute level is higher than normal. However, both the Upside Skew and Downside Skew are at extreme levels, highlighting potential positives to the stock, as investors are paying up for upside and paying lower prices for downside protection. 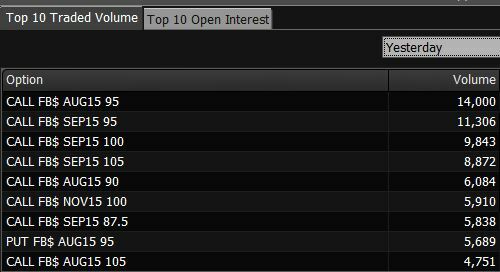 Looking at the Top Ten Traded Volume for yesterday, the most active contracts are the near dated out of the money calls. FTSE 350 Earnings Positioning Report – 3 Stocks To Watch…..
As we move headlong into Q2 reporting season we again turn to the Earnings Positioning view in OTAS whereby we cut through all the noise and discuss those stocks which may be carrying unanticipated risks or conversely present a potential investment opportunity which the broader market may be overlooking. Here, our focus is on the companies in the FTSE 350 which report Sales or Earnings next week. 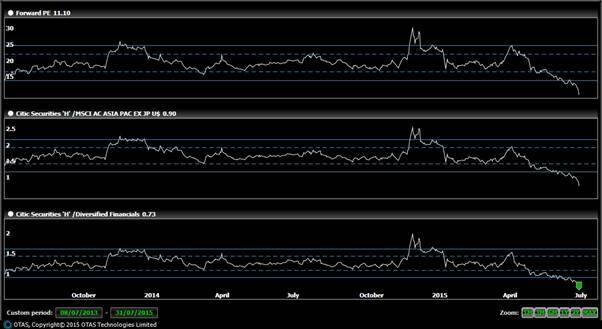 Of the 35 companies which report next week, Fresnillo shares are one of only 4 who’s current share price condition is in a technically oversold state on a standard RSI measure. Performance year to date has been nothing less than horrific with the shares down -19% in absolute terms whilst under-performing the broader Basic Resources sector by around -10%, however, looking at recent price returns that relative bet may be unwinding with the shares finding some positive momentum, outperforming peers by +3.5% in the last week alone. 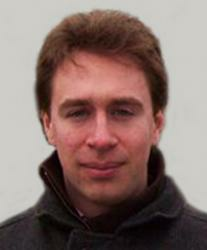 With just under 15% of shares currently on loan, short interest remains at extremely inflated levels and has seen little signs of contraction suggesting Hedge Funds are happy to run positions in Fresnillo into numbers so perhaps it is value funds, who may now be focussing on it’s inexpensive valuation and considerable contraction in implied volatility levels, that are re-adjusting sector weightings helping contribute relative support for the shares. Other factors such as earnings expectations continue to be revised downwards putting them in the bottom quartile of the sector for downgrades over the last month. 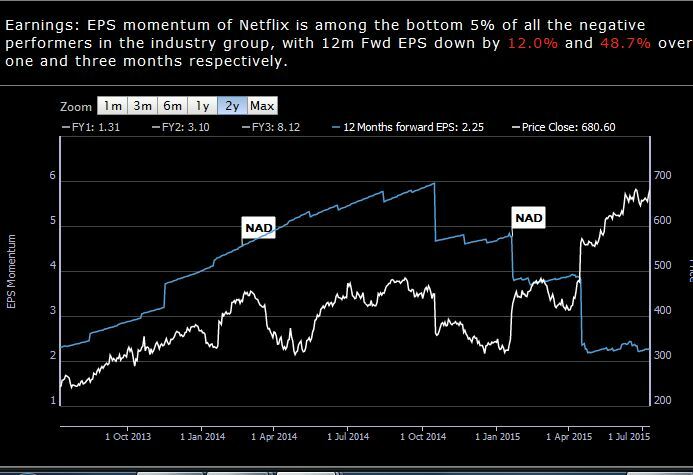 Analysts forecast 12m fwd EPS estimates have been cut by just under -7% whilst seemingly the adjusted market price has more than reflected this, -13% in absolute terms over the same period. 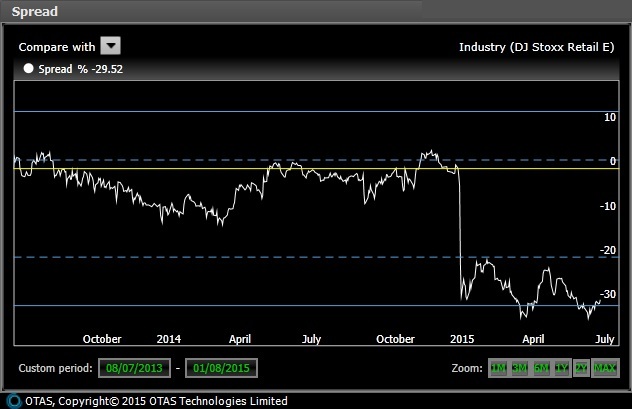 The shares remain a consensus ‘Buy’ rating currently offering a 28% discount to the median analyst price target. Another Company which heads into its Sales release on the back of less that spectacular performance is Enterprise Inns. With investors continuing to shun the beleaguered pub sector following proposed structural Government reforms at the end of last year the shares have returned just +2.4% year to date and have underperformed the wider European Travel & Leisure sector by c-14%. Screening the stock on the Earnings Positioning view some interesting elements are observed. 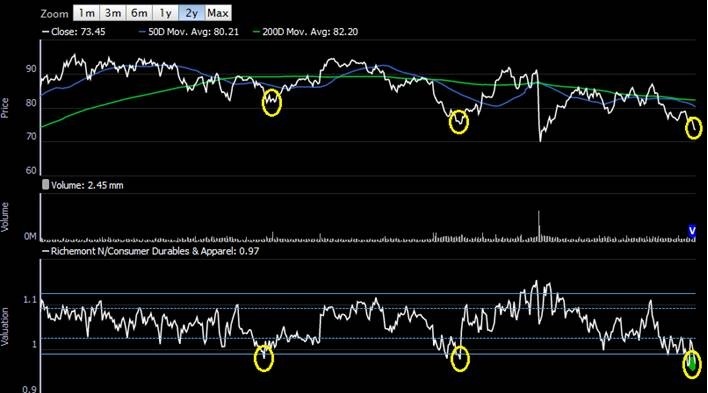 Similarly to Fresnillo above, technically the shares are now oversold on the RSI measure and are also within touching distance of the 200dma, potential support indicators for traditional chartists. From a fundamental perspective analyst forecasts have remained largely unchanged in the last month, seeing just 40bp downward revisions to estimates. The price action over this period (-10%) suggests the market is anticipating a far worse earnings scenario this time around. Such concerns are clearly not being expressed by management however. 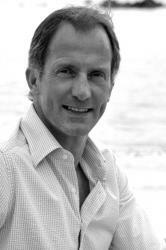 Just last week Chairman Robert Walker purchased 160,000 shares in the company, only his second purchase to date with the shares rallying +12% the following month post his previous transaction. Our rating system shows he is the most reliable of all directors at Enterprise when considering their historic back-tested performance. Direct Line shares have continued to attract investor attention due to the current favourable pricing environment in car insurance premiums and its aggressive dividend policy (DLG group current 12m fwd yields is 8%,) however the Earnings Positioning view highlights some potentially negative risk indicators are forming ahead of its earnings release next week. Performance-wise Direct Line has blown its closest competitors out of the water this year, generating returns in excess of 20% versus the sector and closest peers with 1 week price action showing little signs of slowing. However, it is the more fundamental factors which are flagging that could interpret signs of stress. Over the last month 12m fwd earnings estimates have been revised down by a shade under 3% which puts them amongst the bottom 5% of negative performers in the industry group, yet despite this the shares have rallied 12% over the same period. This relationship between price and EPS has become the most statistically diverged across the entire European Insurance sector. As a result of the strong share price performance the current 12 Fwd P/E valuation of 12.6x is at its peak multiple on an absolute basis at 2 year highs relative to the sector. Dont forget, similar such screening can easily be conducted across your own Portfolio or stock watchlist. This morning, OTAS intraday Alerts fired consecutively in 4 Real Estate names indicating an unusually aggressive move down in the shares over the last hour. 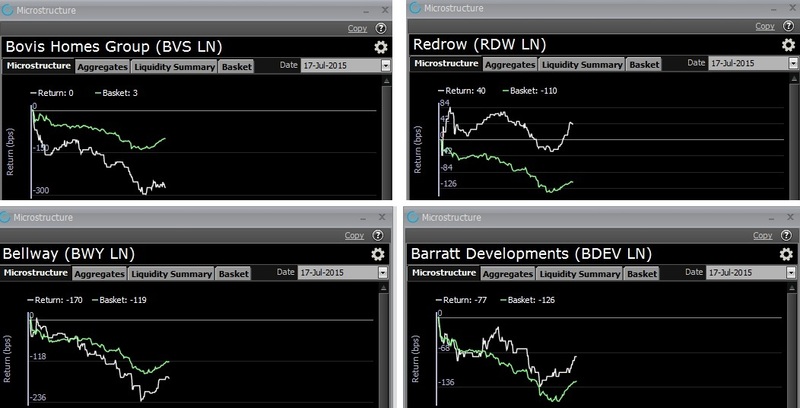 Bovis, Redrow, Bellway and Barratt Developments all flagged that their absolute share price returns were now exceptional compared to how they would typically be expected to trade over a similar time frame historically. When analysing the individual microstructure of each stock none were experiencing significantly high volumes to accompany the move. They were being inadvertently forced lower. Noting such a high concentration of sector peers exhibiting similar behaviour in performance implied an unrestricted Sector ETF or Real Estate basket seller was at work. Whoever was trading the basket had little consideration of the impact they were having or the magnitude of their actions. However, it seems these idiosyncratic share price moves were alpha signals to some market participants/OTAS users. The OTAS ‘Return Low’ Alerts identified the price* inflection points almost to the minute – with all 4 stocks rallying from their lows. Manage your order flow better or take advantage of those that dont via OTAS Alerts. 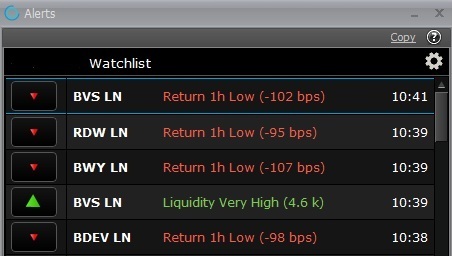 OTAS Lingo/Top Stocks highlights the top 5 positive stocks and bottom 5 negative stocks in a watchlist and/or market. 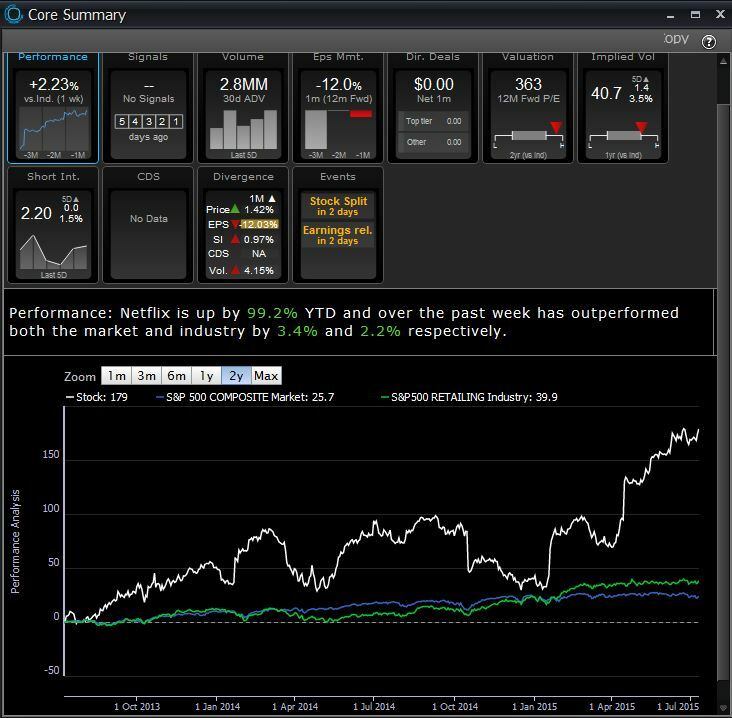 As we head in the Q2 earning season, using the OTAS Lingo/Top Stocks feature is a helpful way to keep an eye on changes in your watchlist and/or market. We can see that with an event coming up in 2 days, EPS Momentum has been negative over the past month and divergent with price, Valuations are expensive and Implied Vol is higher than normal vs. the industry group. The ability to add the ‘Top Stocks’ feature to any Lingo report will immediately identify those stocks in a portfolio, index or sector which currently rank highest in terms of positivity and negativity when analysing all the current market observables in OTAS. 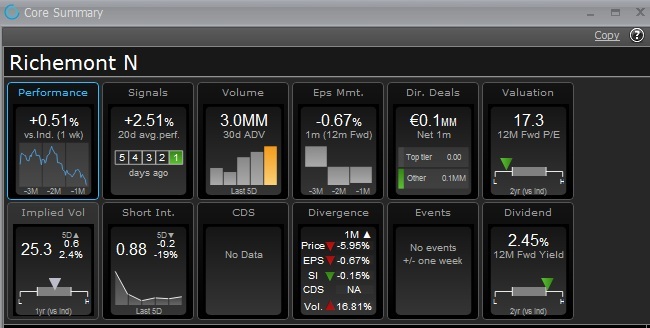 N.B – There was also unusually high volume yesterday with the stock outperforming the sector by +0.6%. Signals – Richemont is displaying positive technicals with a Fast Stochastic buy signal firing overnight, this follows a successfully backtested Bollinger Band buy signal also firing this week. N.B Its most statistically successful buy signal (+RSI, 76% win rate) is also very close to firing. Dividend – The shares current 12m Fwd yield of 2.45% is high compared to the sector over the last 2 years and is over 2x covered by earnings and free cash flow. Performance (Sector Spread) – Richemont shares are again beginning to find relative support vs peers, bouncing from similar levels seen at the start of April. Market Consensus – Buy rated by sell side analysts, the shares offer the largest discount(-22%) to the median consensus price target of its closest peers. Director Dealings – A Level C Director has bought shares in the last month, our backtest shows that typically the shares are +3% & +12% over the next 1 month and 6 months repsectively. Short Interest – The percentage of free float of Richemont shares on loan has decreased by 18% over the last week, with just 0.88% currently on loan. The HSI continues to plunge. The index fell more than 1000 pts today and is trading below the 24000 level. Chinese brokers have been one of the worst performers and news of State-backed Haixia Capital selling its entire stake of $880m in Haitong Securities has certainly weighed down the sector. The News Component under the OTAS Launcher bar provides access to full details on this deal. 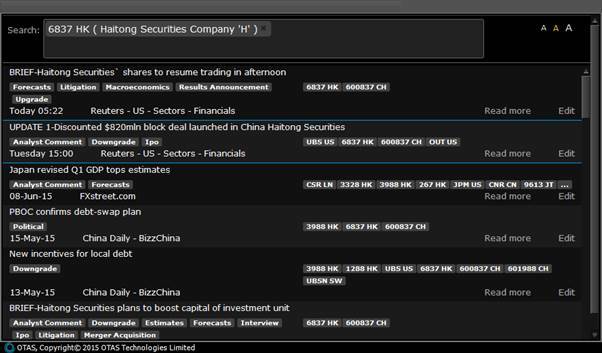 Chinese brokers’ H shares have been as much as -30% this morning, although most regained some ground to be -10% as of midday. 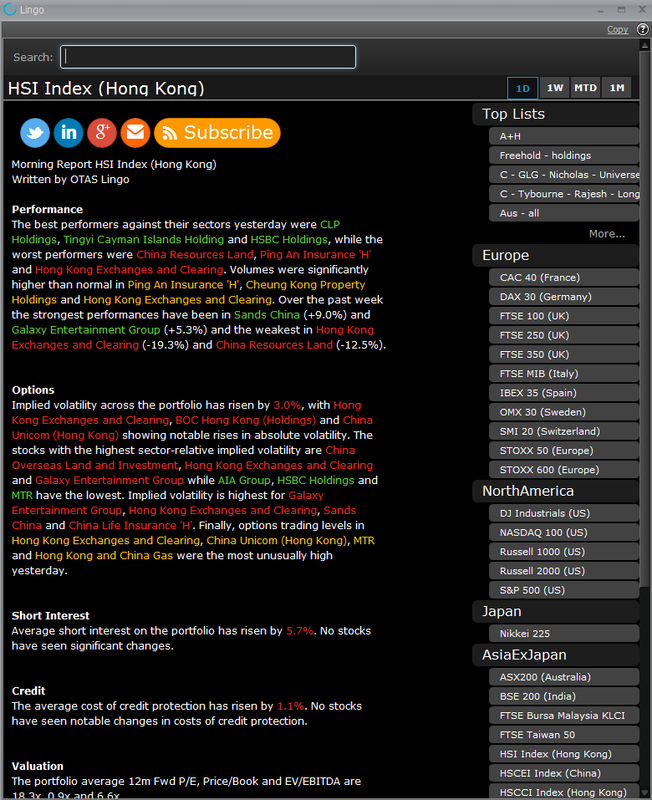 Citic Securities ‘H’ (6030 HK) has underperformed the industry by 19% over the past week and is now trading at an exceptionally low valuation relative to peers. The 12 month forward P/E valuation of 11.1x is also very low when compared with the average valuation over the past two years. Similarly, in the mood of panic in the market, there has been a large dumping of shares in both China Galaxy (6881 HK) and China Everbright (165 HK), each of which plunged by over 20% in the past week compared to their sector. Both now flag as relatively very inexpensive and have rising EPS momentum, while short interest is down over the past month.